Warning! This is not my usual aviation post but instead another crazed political rant. If you don't mind Bushie and his pals picking your pocket to the tune if $7oo billion as they all head out the door, then you might want to click out of this post now. But if you are like literally everyone I know who thinks this Wall Street bailout stinks, then read on. I have been doing an informal poll today, asking anyone I communicate with what they think of the financial bailout that BushCo is shoving down our throats. As I expected, not one person, GOP or Democrat, man or woman, is in favor of this bailout plan. None. Zero. Not one person. Average Joe and Jane on the street cannot comprehend what $700 billion looks like. Most of us dream of one day becoming a millionaire, and a 1,000 millions is a billion. Another 1,000 millions, and you'd still have just TWO billion. 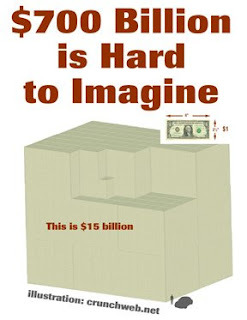 Look at the image above...that gigantic mountain of cash represents just $15 billion in one dollar bills. The little gray image in the bottom right is a CAR! I'll wager that $700 billion in ones would dwarf the Titanic. That's right, no reviews of any kind. Now if this garbage plan was all above board, what harm would their be in a court or administrative review? They want you to look the other way on this bailout, and if we do, the population of this land is more ignorant then I thought possible. O.K., now back to our regularly-scheduled programming...aviation. WASHINGTON (CNN) -- The FBI is investigating Fannie Mae, Freddie Mac, Lehman Brothers and AIG - and their executives - as part of a broad look into possible mortgage fraud, sources with knowledge of the investigation told CNN Tuesday. An FBI spokesman said that 26 firms were currently under investigation as part of the bureau's mortgage fraud inquiry. I hope this FBI investigation makes Enron look like a two-bit shell game. Anyone want to debate the ethics of Bushie's Washington NOW?